When it comes to my trusted bookish friends there seem to be three authors that can easily create a mass hysteria whenever they have a new book coming out (and also every time in between^^): Patrick Ness (of whom I’ve read only three books so far but can definitely already see why everybody loves him/his stories), Maggie Stiefvater (whose books I honestly couldn’t be any less excited about because they’re so not my cup of tea, I’m afraid) and Victoria (or V.E.) Schwab who to me seems to have the biggest fandom of those three – at least if I take my Twitter timeline as a benchmark. 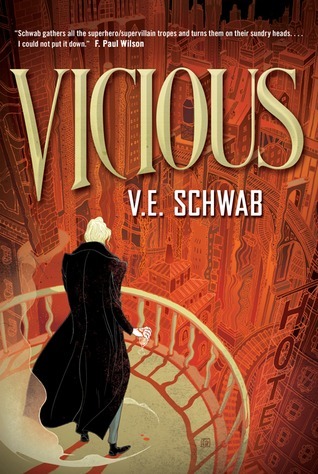 Since I had never read a Schwab book I felt that it was about time to give one of her novels a try and „Vicious“ seemed to be the best choice for me because come on, a story about people with superpowers and two villains as the main characters? That’s so right up my alley that I just couldn’t resist in the end and all the praise for this book made me super excited for it. And I don’t think „Vicious“ could have started any better than with a scene at a cemetery where two of the protagonists are digging up a corpse in the middle of the night because that’s the kind of first chapter that immediately hooks me to a book. And for me it got even better because the next setting that was introduced to the readers was a university and personally I always had a thing for stories that are set at colleges, boarding schools or universities. Another thing I immediately fell in love with was the narrative style because Schwab jumps back and forth in time every few pages. For the first few chapters one half of the events took place in the present over the course of a few days and the other half ten years in the past where we meet Victor Vale and Eli Cardale, the two main characters in this book, during their time as students at Lockland University. With non-chronological narratives like this there’s always the risk that they end up being pretty confusing – like it happened to me with Erin Morgenstern’s „The Night Circus“ where the many leaps through time and space kind of ruined the story for me – but the way V.E. Schwab did it worked out pretty well and made the story even more interesting for me. I also liked that the chapters were usually quite short so there were quite some nice little cliffhangers every few pages which made it really easy to get lost in the book and read „just one more chapter“. Now let’s talk about the characters because how cool is it that both main characters are villains? There’s Victor Vale, son of two famous shrinks who always preferred promoting their self-help books all over the world over spending time with their child so that Victor was forced to grow up with the constant feeling of being neglected and even as a young adult is still holding a grudge against his parents which manifests in him vandalizing their books with a Sharpie as a form of silent protest. On the other side there’s Eli Cardale, the guy with the winning smile who always seems to be on the right side of life but can’t completely hide a certain darkness inside himself – at least not from those who know how to read the signs, like Victor who even though he’s always been a bit jealous of Eli for being everybody’s darling or getting the girl that he once had laid eyes on just can’t help feeling attracted to him (in a non-sexual way). So almost right from the very first encounter of Victor and Eli there has always been some kind of love/hate-relationship with being best friends and biggest rivals at the same time. Now a little rivalry at university of course isn’t enough to make someone a real villain, that’s why there are also SUPERPOWERS in „Vicious“. Victor and Eli live in a world where there are rumors of gifted people with special abilities, so-called EOs – ExtraOrdinaries. And if you feel attracted by the dark side and are really competitive, what can be your goal in a world like this? Of course, becoming one of those EOs yourself. And what’s the worst thing that could happen to you? Seeing how your best friend and biggest rival manages to succeed at this while you just end up almost killing yourself while trying. I really liked how V.E. Schwab introduced the superpower theme in this story because it started really slow and as some kind of science project but soon got out of control pretty bad but without being over the top as in people flying through the air wearing capes or shooting laser beams out of their hands or whatever Hollywood movies or comics are telling us superheroes/villains look like. The way Schwab describes the process of gaining and having superpowers makes it seem almost realistic, even though I sometimes found that things were a bit too easy for the characters. Can I have at least some worldbuilding please? So there are a lot of great things in „Vicious“ and it’s almost impossible not to enjoy the book if you’re into villains or superpowers but unfortunately I just couldn’t get myself to LOVE it because there were just too many small things that bothered me, starting with the worldbuilding – which is almost non-existent. Like I wrote above this story is set in a world where there are people with superpowers but I never really got to see what this world actually looks like. All was focused on the few characters but I couldn’t help wondering how the world reacts to all the ExtraOrdinaries showing up. Yes, there were only rumors about them at first but even when weird things are happening in public the reader never really gets to know what consequences this has on the world outside of Victor’s and Eli’s microcosmos. „Vicious“ definitely works without a detailed worldbuilding but I at least wanted to know how the places that I visited in the story looked like but I’m still not able to imagine the appearance of Merit City for example. V.E. 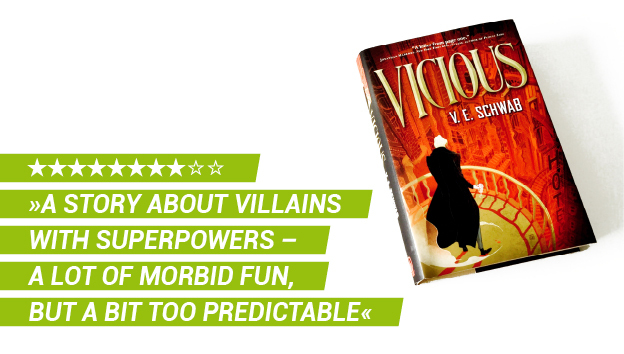 Schwab's "Vicious" is a story for everyone who prefers villains over heroes, loves to read about people with superpowers (and how they misuse them) and enjoys a non-linear but gripping narration – even though the plot might lack some surprises and could have used at least a little bit more worldbuilding to make it really ExtraOrdinary. Well, I think an 8/10 is a mark of a good book, so I’m happy you liked it. Maybe the enormous amount of hype ruined the story for you a bit because your expectations were too high? It happens to me a lot (hello, Illuminae). I found my way to Schwab in a more organic way, I actually read her first-ever book, The Near Witch, before I even started blogging and before Vicious became super popular (what a hipster thing to say, huh?). Anyway, I fell for her writing straight away. I loved the pacing here, I’m glad you compared the switching timelines with The Night Circus because I was lost with that one, too! But here it just made for a whole lot of tension.